Manchester Metropolitan University, Special Collections, Friday 29th January 2010. Sylvia Waltering and I presented a paper on our collaborative project 'Belongings'. 'The production, consumption and interpretation of narratives in visual form is central to contemporary cultures. Within this context, the notion of narrative finding expression in the visual can be traced, for example, in the growth of the graphic novel form, the positioning of cinema as subject matter for art practice and the persistence of the artist’s book as an art form. Visual narratives demand specific forms of readerly interaction and critical response. They require a shift of reading focus from text to text-and-image or to image-only, and therefore require different critical apparatus and analytical skills. the potential for narrative within the artefact. 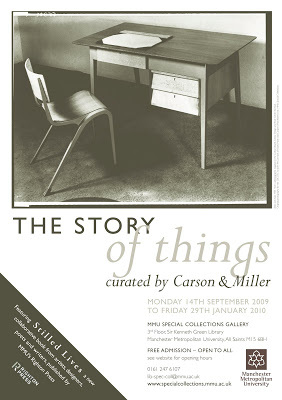 Keynote Speaker: Patricia Allmer – Relating the Story of Things' - Carson & Miller 2010.